Hey, it will be easter soon - 31st March 2013 right. I have been looking for papercraft that is suitable for it. 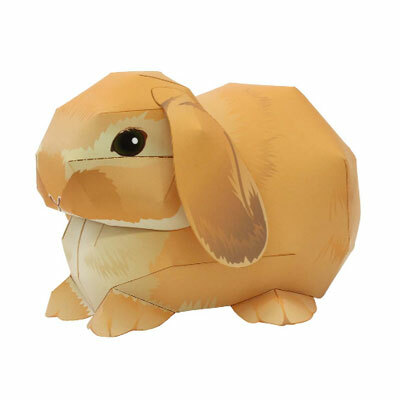 I was thinking on looking for egg basket, bag or something but I found this cute brown rabbit paper toy instead which is worth sharing too. Years back, I have made a post on rabbit paper model. The color is grey so if you are looking for another color or to make varied type of bunny then please check it out. The rabbit that I'm presenting today is Holland Lop, smallest breed of lop-eared rabbit. While the previous rabbit was Netherland dwarf species. Both are cute and both can be found at the same site, Canon Creative Park. Notes : This nice art work is prepared by Ayumu Saito for Canon Creative Park. It's different that the other paper model at the site because there is only 1 pattern to choose. I'm not sure if it's for letter or A4 size but i do not think it does any matter. There is 1 instruction file that you can download to guide you in folding process. For the next papercraft, I will look for more easter theme probably bag or paper box and if you find something that worth sharing too please leave me the link to the craft - it will be helpful. Until then, happy crafting and Easter day. If you like this papercraft, mind to share it with your friends? wow creative & attractive. I like it. thank you.